Computers, ovens, and even light bulbs rely on water cooling to function; nearly 200 billion gallons a day in the US alone, most of it is fresh water. Some of it, roughly 4 billion gallons, evaporates into thin air each day. In today’s guest blog, Dr. Pablo Hidalgo – a thermal management research engineer at Georgia Institute of Technology – provides a wonderful overview of cooling techniques used in thermoelectric power plants and discusses a little used thermal management approach that will help us reclaim one of our most precious resources: fresh water. Did you know that 41% of the water withdrawn in the US is used for cooling thermoelectric power plants while only 14% is dedicated to domestic and public supply? What if I told you that the amount of annual non-recoverable fresh water used to cool these facilities could grow five years’ worth of the worldwide potato crop? Fresh water management is a challenge we need to tackle. Globally, approximately one billion people lack adequate access to fresh drinking water, and fresh water supplies are diminishing as our population grows and our climate changes. Moreover, the International Food Policy Research Institute has predicted a 120% increase in food prices by 2025 due to the shortage of fresh water resources. I’m not trying to discuss a completely new form of power generation in this blog, or take a position towards renewable energy or nuclear. I simply want to make readers conscious of what it takes to keep their computer, tablet or phone running while viewing this article. I’ll also touch on how self-oscillating reeds might be used to improve the efficiency of dry cooling, an alternative to liquid cooled power plants. Thermoelectric power plants generate about 90% of this nation’s energy and cooling them is no small task. There are basically three types of cooling systems used in these facilities: once-through, wet recirculating, and dry cooling. Only by improving the efficiency of the latter can we hope to reduce the estimated 4 billion gallons of fresh water that is lost through evaporation every day. 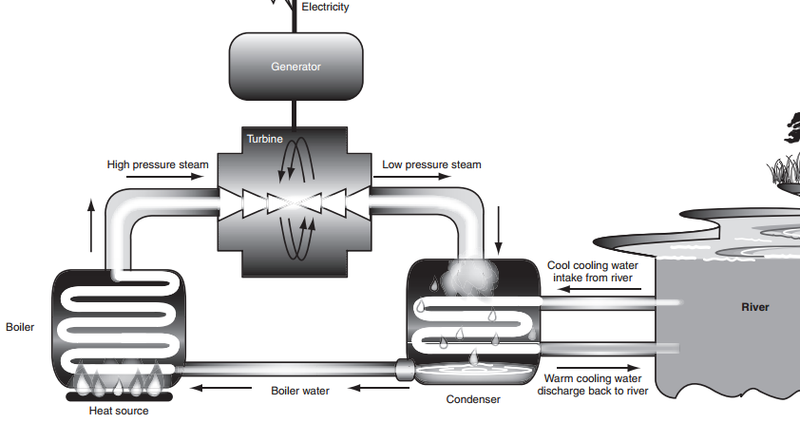 Used in just over 40% US thermoelectric power plants, once-through cooling requires a tremendous amount of natural source water that is pumped into liquid cooled condensers used to convert the steam coming from the turbines back to water. As its name suggests, the cooling water passes through the system only once, after which it is expelled back into the lake, river or ocean. While no appreciable amount of water is lost during the process, this system wreaks havoc on the environment in the form of dead marine life and changes to the ecosystem. Due partly to the Clean Water Act of the 1970s, once-through cooling is usually only seen in facilities built more than forty years ago. Wet-recirculating systems using cooling towers are the predominant type found, and being built, in the United States. 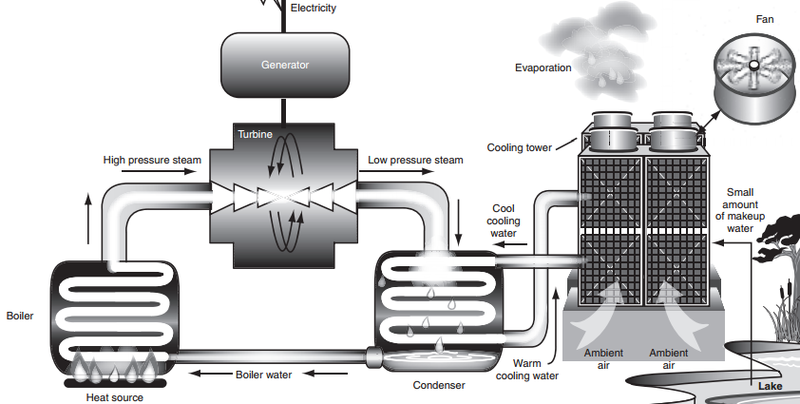 Rather than being returned to its source as with once-through systems, warmed cooling water is sent to cooling towers and then reused. The great advantage of this system is that, once primed, it uses up to 95% less source water, greatly reducing the impact to aquatic life. On the flip side, water loss is substantially higher. According to the National Energy Technology Laboratory, a single 520 megawatt power plant using this system will lose 4,000 gallons of water per minute due to evaporation and another 1,000 gallons from blowdown (the discharge of mineral laden water). And this brings us to the newest system being used – dry cooling. Currently, only a small fraction of power generating facilities use dry cooling. Rather than relying on evaporative cooling, these systems pass the steam though air cooled finned tubes which condense it back to water that is re-fed to the boiler. With no water loss due to evaporation or blowdown, these systems are ideal for conserving fresh water supplies, but they come at a higher price tag than either of the other two technologies. A part of that cost is due to the fact that dry cooling is much less efficient that evaporative cooling. I am going to focus on some specifics of this cooling technology and elaborate on a potential strategy to improve it, which I am currently working on and that I believe can have multiple applications. The efficiency of air cooled condensers (ACCs) is very poor, on the order of 0.3 and this efficiency is reduced further when ambient air temperature is high (i.e. summer time). 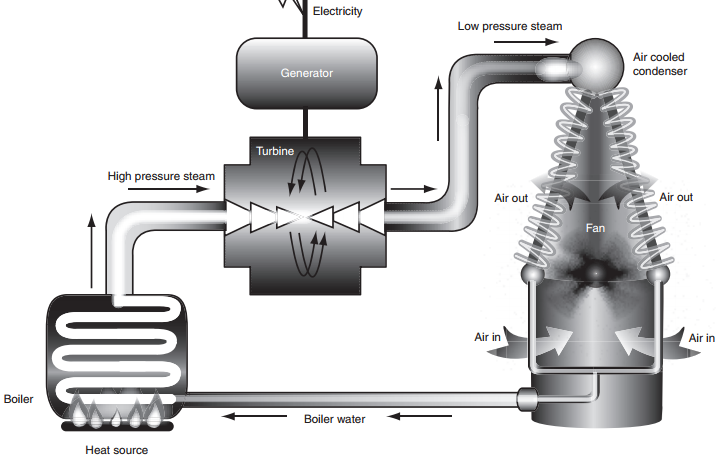 Under these conditions, the temperature difference between the air inlet of the ACC and the steam is reduced resulting in decreased system efficiency and increased back pressure to the turbine. The net result, power generation capability is reduced. According to the Department of Energy, during the summer the plant efficiency and power generation can decrease up to 25%, which is precisely when the demand of electricity is highest. The greatest benefit of air cooled condensers is the lack of use of water for cooling but they also have some significant drawbacks. For instance, the real estate needed to achieve the same cooling performance is over 2 times larger compared to that of a wet cooling tower. This is part of the reason the cost to build one these facilities is several times higher than that of alternative solutions. Another disadvantage is the dominant air-side thermal resistance. A representative value of the heat transfer coefficient (HTC) of the fins is on the order of 30 W/m2K. For a forced convection system, this is a very low value with poor heat transfer capability. The fact that the ACC’s air side channel Reynolds number is in the laminar regime also contributes to such poor heat transfer, but air cooled condensers are designed for minimized flow losses and fan power. Here’s an approach that improves this technology. It’s based on some results I obtained working on a different project but with significant similarities between them. On a previous DARPA project at the Georgia Institute of Technology, I participated in the development of a novel technology to improve the heat transfer of high-power heat sinks used in aerospace for military applications. We integrated an array of self-oscillating reeds (SORs) in between the channels of a heat sink in order to improve thermal performance. 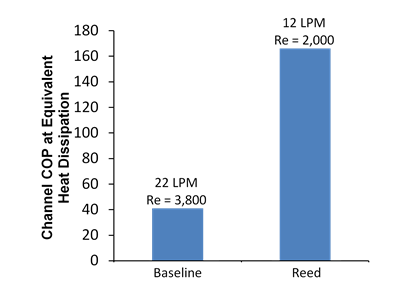 Figure 4 shows several images of the 2.5mm x 10mm reeds before and after integration in a full scale heat sink – click for video. 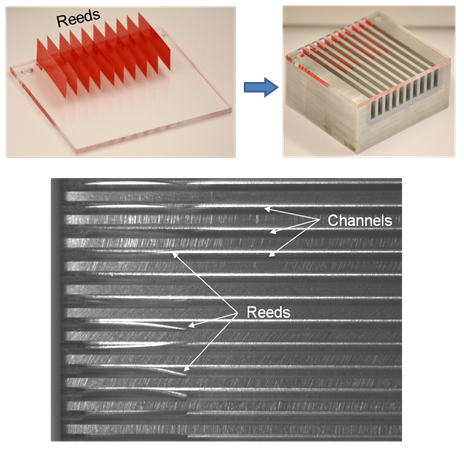 The reeds are fabricated using laser micro-machining techniques out of polyester because of its low density and ability to flutter using only a small amount air. The SOR is mounted and constrained as a cantilever beam. As air passes over them, they flutter creating turbulence which minimizes the boundary layer and increases the heat transfer coefficient. Our studies showed a tremendous increase in the coefficient of performance (COP) of the channels. Under the same heat flux and similar wall temperature distribution in our test bed, the SOR-enhanced channel showed an increase in COP of 400% with respect to the baseline channel (no reeds) as shown in Figure 5. Here, the flow rate for each case is measured in liters per minute, which represents two different Reynolds number (Re). For constant heat dissipation, the increase in mixing in the SOR-enhanced channel would result in a decrease in wall temperature. Therefore, it’s possible to dissipate more heat while maintaining the same wall temperature. In this case, our results have shown an increase in power (heat) dissipation of over 40% using this technology. In addition to being adapted for use in a wide range of fields, data center and semi-conductor applications among others, self-oscillating reeds could be incorporated into the air cooled condensers used in thermoelectric power plants. It’s an important first step in making dry cooling an appealing alternative to wet-recirculating systems. Four billion gallons for fresh water could be saved every day. Whether you’re involved in the thermal management of power electronics, servers or mobile devices, it’s important for all of us to help make power generation more economical and environmentally friendly. Increasing the efficiency of dry cooling is an area where thermal engineers can certainly have an impact. Please comment on other ways we could improve the efficiency, cost and environmental impact of power generating facilities. I’m also very interested in hearing ideas about how self-oscillating reeds might be used for other applications in your field of expertise. Dr. Pablo Hidalgo is a second level research engineer in the fluid mechanics research lab at the Georgia Institute of Technology. His specialties include experimental fluid mechanics, system level thermal management, convective heat transfer, heat sink design, CFD and conjugate heat transfer simulations, flow control, fluid-structure interactions and aerodynamics. Dr. Hidalgo received his Ph.D. in Engineering Sciences and Mechanics from The University of Alabama in 2008 and his Bachelor’s and Master’s degrees in Aerospace Engineering from Saint Louis University in 2003 and 2005 respectively. He is actively involved in the program committee of Semi-Therm and is a member of APS-DFD.